He earlier worked as an engineer at a colliery and as a static engine driver. 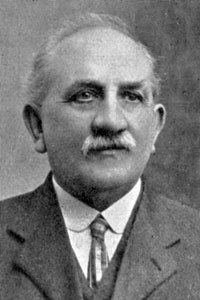 Father of Peter Westhead, Chairman of Westhoughton UDC 1927-28. First elected 1902 but lost his seat in 1905. He was re-elected in 1907. Member of the Westhoughton and Horwich Education Committee. He was the first Liberal Chairman to be elected under the 'compromise' arrangement. Chairman of Westhoughton Liberal Association. He also acted as Overseer and was one of the managers of the Parish School. His untimely death was considered to be a result of the stress he was under after the Pretoria Pit Disaster on 21 December 1910 and the conscientious and caring way he undertook the enormous responsibilities he had as Chairman of the Council. He was treasurer of the Westhoughton Branch of the Mayor of Bolton's Relief Fund for the Pretoria Disaster. He was also on the jury of the Coroner's inquiry regarding the victims of the Pretoria disaster. He had spent considerable time at the improvised court at the Pretoria pit head when the bodies were being identified by the relatives. It was in the midst of this work that he fell ill with pleurisy, and died of a heart attack while recovering from this illness. He was a Congregationalist and worshipped at Westhoughton Congregational Church. The Minister there, the Rev Robert H Lord, said, "Mr Westhead was not in the best of heath when the disaster happened and extra strain was imposed both upon body and mind in the work of the inquest and the Relief Committee. Their friend was one of the aftermath of the harvest which the great reaper of death so recently gathered in. He sacrificed his life in the performance of his recent public service and there was no doubt his decease was accelerated by the disaster." The Rev George Henry St Patrick Garrett, the Vicar of Westhoughton, expressed similar sentiments. He said "He had sacrificed his life in his desire to comfort, as far as might be, those who had been in such trouble lately. They knew his unceasing attendance at the pithead and of his desire to relieve those suffering in any way. His last remembrance of him was seeing him attend with bare head at the grave where they were committing the unidentified bodies to the earth."